An isolated archipelago in the Indian Ocean, located midway between Madagascar and the coast of Antarctica (see map or satellite view), Les Îles Crozet mark the only places where the Crozet Plateau breaks sea level. Consisting of 5 large and 15 tiny islands, with a combined area of about 116 mi² (300 km²), the archipelago is divided into two main groups: L'Occidental, or western – comprising Île aux Cochons, Îlots des Apôtres, Île des Pingouins and the reefs Brisants de l'Héroïne; and L' Oriental, or eastern – comprising Île de l'Est and Île de la Possession, the largest of the Crozets, about 60 mi./100 km away. 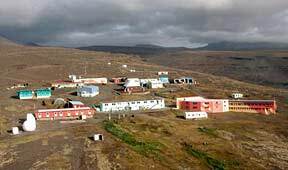 The Crozets form one of the five regions in the Terres Australes et Antarctiques Françaises (French Southern and Antarctic Territories), which also include Terre Adélie (Antarctica), Kerguelen, the islands of Amsterdam/St-Paul, and the Scattered Islands surrounding Madagascar. Since 1938 the Crozets have been a National Park, with protection for the abundant wildlife and unique flora and fauna. The French "administer" these islands in a way that is reminiscent of nineteenth-century empire, even though there are no electors or permanent residents. A characteristic of all the Austral islands, and a complication for the logisticians, is that there are no natural ports or airstrips. The Crozets are visited several times a year by the Marion Dufresne, the world's biggest and most sophisticated oceanographic research vessel, bringing supplies and rotating crews of scientists at Alfred-Faure – the permanent base on Île de la Possession. Most transfers are now done by an on-board five-seater Eurocopter Ecureuil AS 350 B2 turbine engine helicopter, which – at just over a ton, with a cruising speed of 226 km/hr. – can lift the equal of its own weight. It takes a short ninety-second trip to fly between the ship and the base, which is 460 ft. (143 m) above sea level. 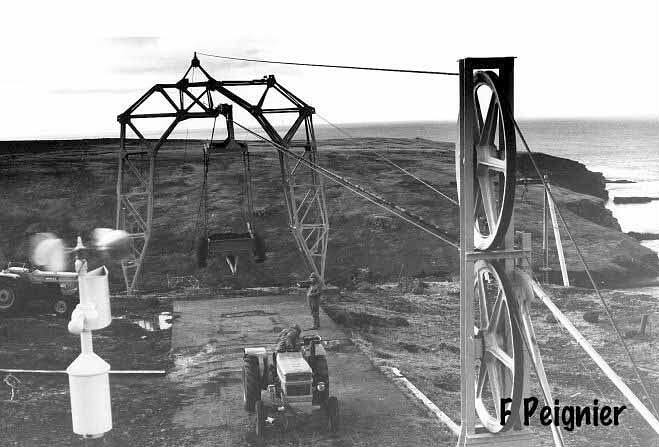 In the years before helicopters were used, materials had to be hauled by a container boat to the beach at Baie du Marin – from which point they were hoisted via an aerial cableway (fr. téléphérique) to the station. 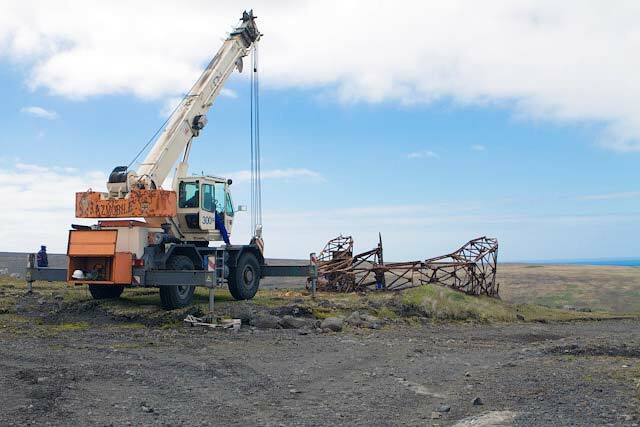 The long disused and rusted cableway terminus at the summit was finally taken down on 29 December 2011. A spectacular sunrise through clouds shrouding the forbidding black basalt cliffs of Île de l'Est forms a back-drop for these landings. For those who have no idea about these islands, their physical appearance is a shock. The first sailors in these parts, such as Jean-Baptiste Bouvet-Lovier, discoverer of Bouvet Island in 1733, and Marc-Joseph Marion du Fresne, discoverer of the Crozet Islands, must have had feelings of being at the end of the earth. 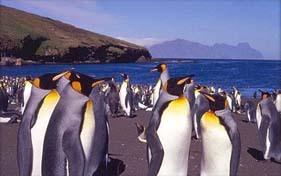 The black volcanic sand beaches, with their background of sweeping empty and treeless mountains, teem with royal penguins and sea elephants. Some of the penguins stand around chatting on the beach, others march in straight lines alongside bubbling streams to join their colony. There are small groups of gentoo penguins and, in isolated spots, giant albatross chicks sitting on their giant nests, stretching their wings, almost ready to launch themselves into the most extravagant flight of any bird on the planet. These birds will roam the seas, not returning to land for 5 to 8 years at a time. In common with other sub-antarctic islands, the (accidental or intentional) introduction of alien species has proved a problem. Rats and mice arrived accidentally, cats were brought in to control them and rabbits introduced as food: all have damaged or destroyed fragile ecosystems. Île aux Cochons is named after pigs which were introduced as food: they multiplied rapidly, causing immense damage before becoming extinct. The same fate befell the goats landed on Île de la Possession. 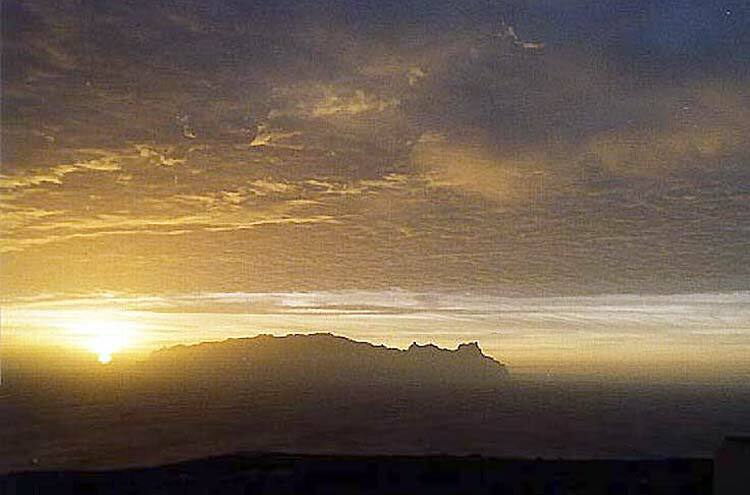 The highest point on the Crozets, at 3,576 ft. (1,090 m), is Pic Marion-Dufresne on Île de l'Est. Although glaciated in the past, there are now no glaciers. Lying as they do in the path of the "Roaring Forties" (between 45°95' and 46°50'S, 50°33' and 52°58'E), the islands are invariably windy, and the frequent depressions arriving from the west bring cold, wet and cloudy weather. On average it rains 300 days per year, and winds exceed 60 m.p.h. (100 km/hr) more than 100 days of the year. The temperature rarely exceeds 64° F (18° C) in summer, though it rarely falls below 41° F (5° C) in winter. 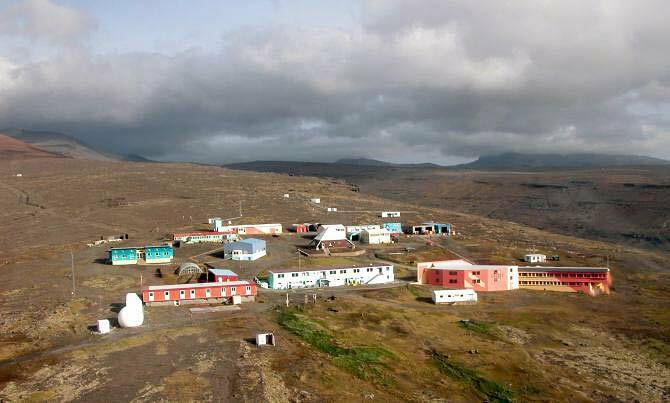 The primary reason for visits to Crozet and the other islands in the territory was to hunt the abundant population of fur seals for their skins, which fetched a very high price. Skilled sealers could kill and skin as many as 60 of these creatures an hour. As a result, by 1835 the fur seal population was nearly wiped out on Crozet and Kerguelen. The trade was then replaced by whaling as the primary industry around the islands – once again dominated by Americans from Massachusetts and other northeastern states. Shipwrecks were the secondary source of dwellers on these forlorn islands – with the ships' crews sometimes being stranded for as long as two years before being rescued. Known wrecks were those of the British sealer Princess of Wales in 1821, and the French Tamaris in 1887. The resourceful crew of the Tamaris turned a Giant Petrel into a "messenger pigeon" by tying a note to its leg. Sadly, though the note was actually retrieved seven months later in Freemantle, the crew was lost without a trace. Shipwrecks became so common that the British Royal Navy sent a ship to the island every 2 to 3 years to search for survivors. Representatives from France had undertaken several visits to the islands in both the 19th and 20th centuries, in order to assert the nation's sovereignty – which by definition requires occupation. 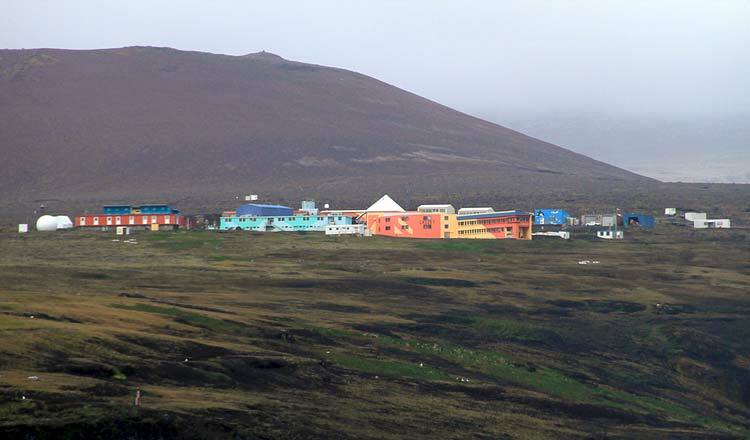 Formerly, the Crozets were administered as a dependency of Madagascar (along with Kerguelen and Amsterdam/St-Paul), but were incorporated into the Terres Australes and Antarctiques Françaises (TAAF) in 1955. Notre-Dame des Oiseaux, the diminutive chapel on on Île de la Possession, was built during the winter of 1984 in memory of Pierre Frigola, a young ornithologist who tragically fell off a cliff at Cap du Gauss the previous summer (see article). Its bell was manufactured at a foundry in Savoie, France, brought to Crozet in June 1994 on the Marion Dufresne I (one of its last voyages for the TAAF), and installed in a humble bell tower constructed by the island's carpenter, Nicolas Douaud. The bell was baptised "Anne", the patron saint of carpenters. The French possessions in the Southern Ocean contribute to its position as the country with the largest Exclusive Economic Zone in the world. 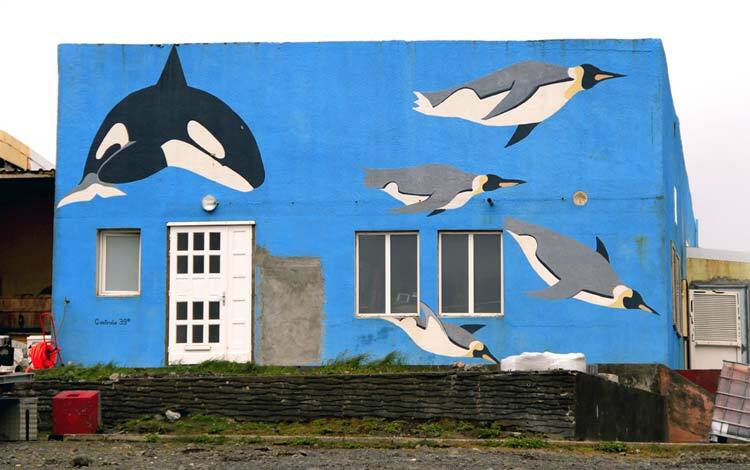 Severe overfishing (principally for Patagonian Toothfish) led France to declare a 370-km exclusive economic zone around Kerguelen, The Crozets and Amsterdam/St-Paul in 1978. This zone is patrolled by French Naval Vessels and also Greenpeace, concerned about the exploitation of the Toothfish and the effect on Albatross Populations. Sources: The Crozet Archipelago, a web site hosted by Paul Carroll. Dante's Purgatory (an article published in Quadrant, July 1999 p.79), by Andrew McIntyre, a Melbourne freelance writer who was invited to the TAAF as a guest of the French government. Philatélie des TAAF, a chronicle of postage stamps created for the TAAF. © copyrights attributable to their respective sources – All Rights Reserved. Relevant publications: Daniel Floch, Les Oubliés de l'Île St-Paul, des Crozets, et des Kerguelens; Abel Janszoon Tasman, The Discovery of Tasmania : Journal Extracts from Marc-Joseph Marion Dufresne 1642 & 1772; Daniel Behrman, Assault on the Largest Unknown: The International Indian Ocean Expedition, 1959-65. Images: Maps of Crozet Archipelago and individual islands, from various sources, including The Crozet Archipelago, a web site hosted by Paul Carroll; the Perry-Castañeda Library Map Collection at The University of Texas in Austin; PDF maps adapted by Jean-Pierre Langer from topographical drawings by the Institut Géographique National (France), Ordnance Survey (Great Britain), Department of Survey and Land Information (Australia), etc. ; several maps were reconstructed and modified from these sources by Ian C. Mills of DiscoverFrance.net; © copyrights attributable to their respective sources – All Rights Reserved. Alfred-Faure base camp on Île de la Possession, photographer unknown, from La Maud Fontenoy Foundation. Alfred-Faure base camp on Île de la Possession, © Stéphane Bommert a.k.a. Stef BoomBoom (photographer, 9 December 2010), from Flickr. 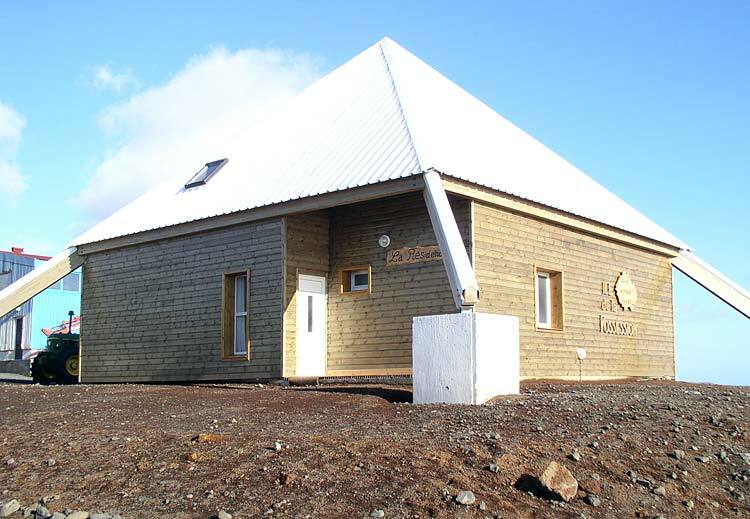 'The Pyramid', new residence of the base's chief administrator, © Nweider (photographer, real name unknown), from Panoramio. Marine fauna décor on Centrale (electrical generation) building at Base Alfred-Faure, Crozet, © Stéphane Bommert (photographer, 9 December 2010), from Flickr. 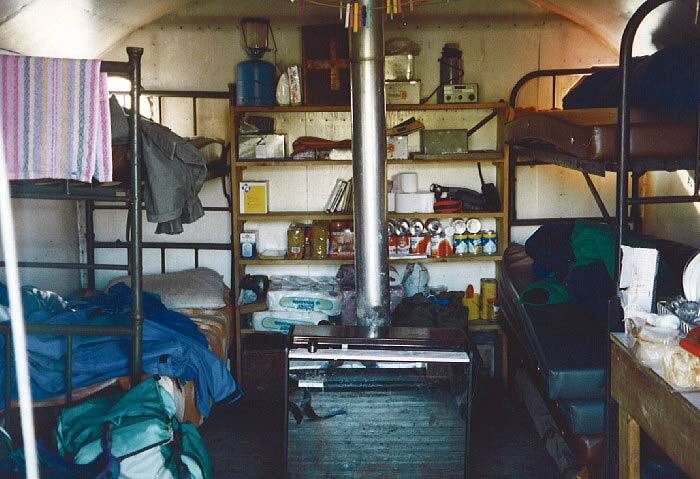 Remote dorm hut in American Bay on Île de la Possession, © Yan Ropert-Coudert (photographer), from SCAR-MarBIN, The Antarctic Marine Biodiversity Information Network (C. De Broyer and B. Danis, Editors). 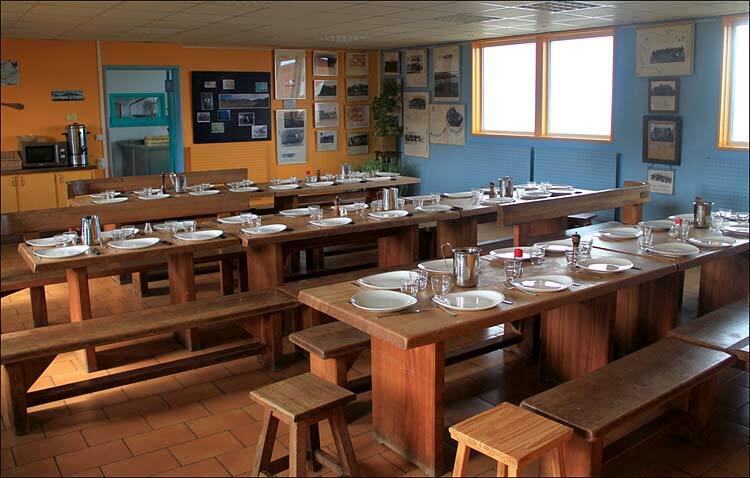 Dining room at Base Alfred-Faure, © Stéphane Bommert (photographer, 9 December 2010), from Flickr. 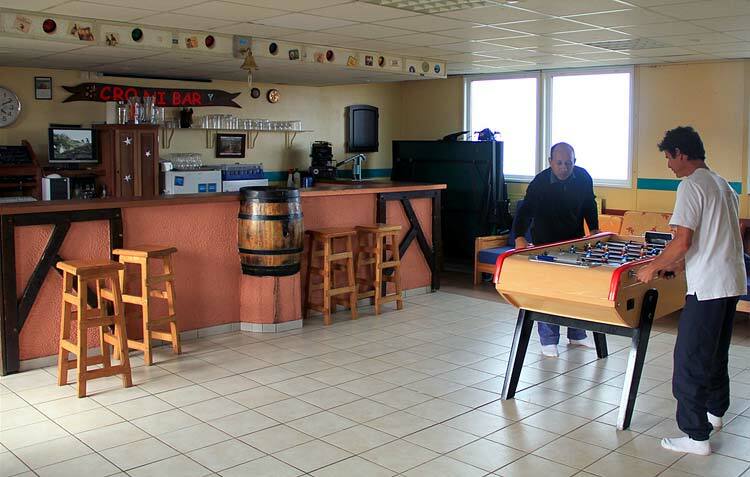 Bar & foosball game at Base Alfred-Faure, © Stéphane Bommert (photographer, 9 December 2010), from Flickr. 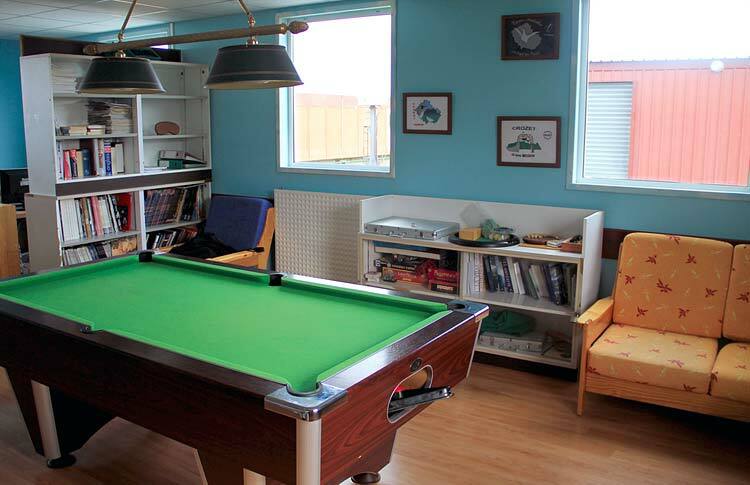 Pool room at Base Alfred-Faure, © Stéphane Bommert (photographer, 9 December 2010), from Flickr. Royal penguins socializing on Crozet © Jacques Bitterly & Gilles Rudelle (photographers), from Volontaires pour l'Aventure. 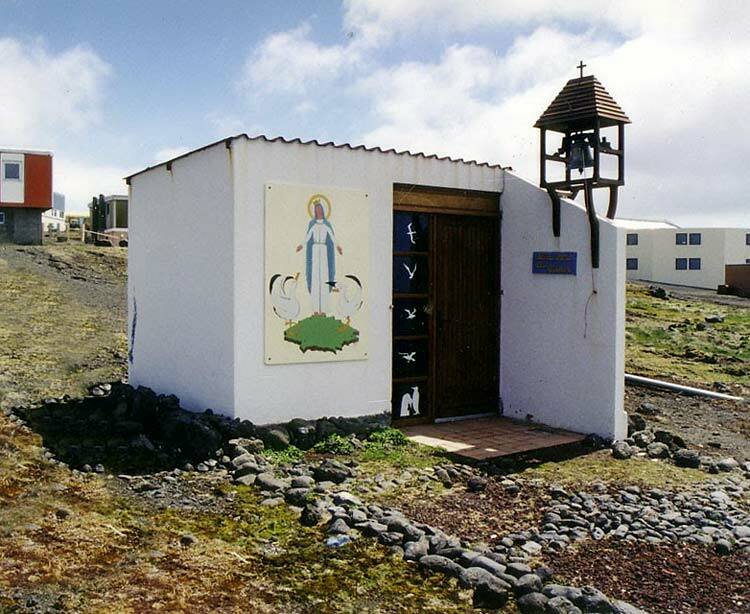 Notre-Dame des Oiseaux, the chapel on on Île de la Possession, built in 1984, JLH974 (photographer, real name unknown), from Panoramio. 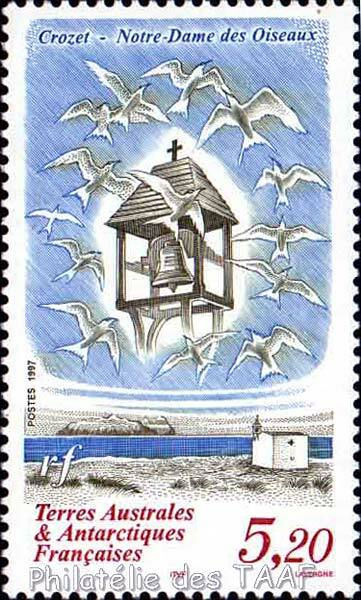 TAAF postage stamp depicting the chapel on Crozet, by André Lavergne (artist), from Philatélie des TAAF. The Alfred-Faure (Crozet) cableway system, pictured in 1973, François R. Peignier (photographer, 4 May 1973), from Crozet Portfolios. 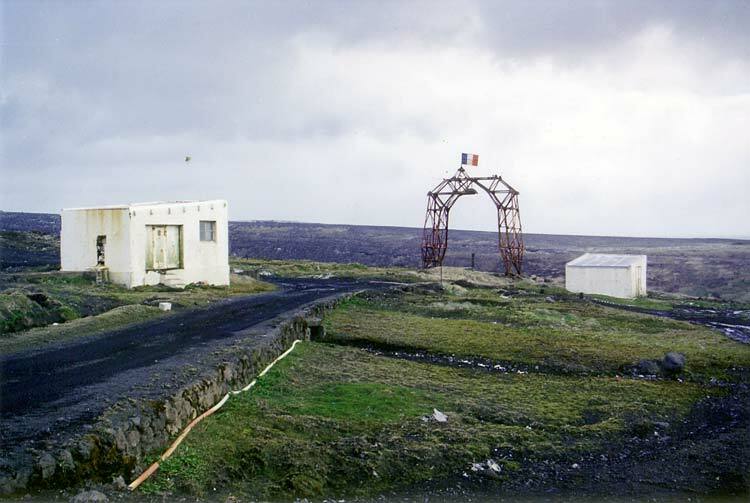 Remnants of the cableway system's top terminus on Île de la Possession, Crozet (11 November 1994), JLH974 (photographer, real name unknown), from Panoramio. 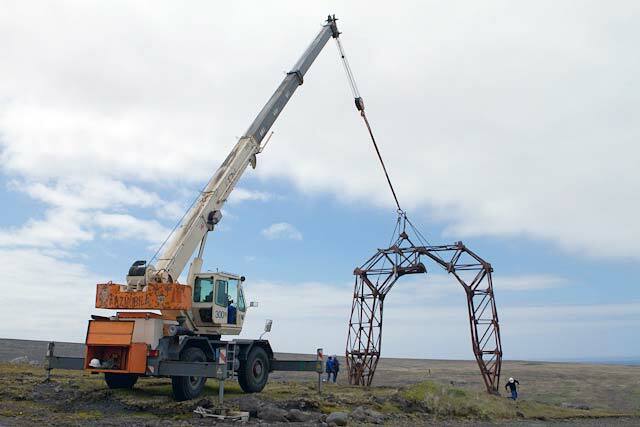 A crane prepares to take down the rusted cableway's top terminus, 29 December 2011 and The rusted cableway's top terminus is finally taken down, 29 December 2011, Philippe Apelt (photographer, doctor on Crozet during mission 49), from Bibcroblog 49. TAAF postage stamp depicting the Patagonian Toothfish, from TAAF – All Rights Reserved. According to Greenpeace, just one year of illegal fishing around Crozet Island reduced the number of Patagonian toothfish by 25%, with catch rates estimated to be more than 12 times the legal limit (CCAMLR, 1997). The Weather Underground provides a week's forecasts for Crozet, plus astronomical observations and weather-related photos.